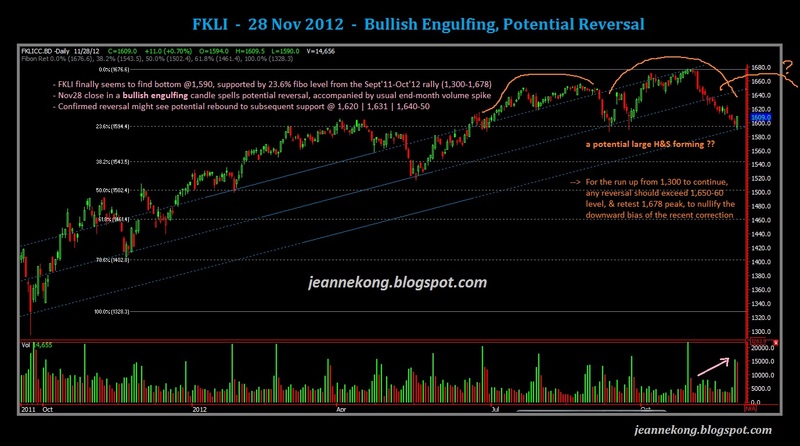 Finally.....We got a red candle at today's close on FKLI. Today's candle mainly signal indecision of the bulls to push price further up, after making 7 consecutive UP-days. Price have since risen a whopping 62.5 points from 1,595-1,657.5. The strong resistance came in at 1,650-60 level , the middle-line of the long-term channels supporting the rally from 1,310-1,677 since Sept'11. 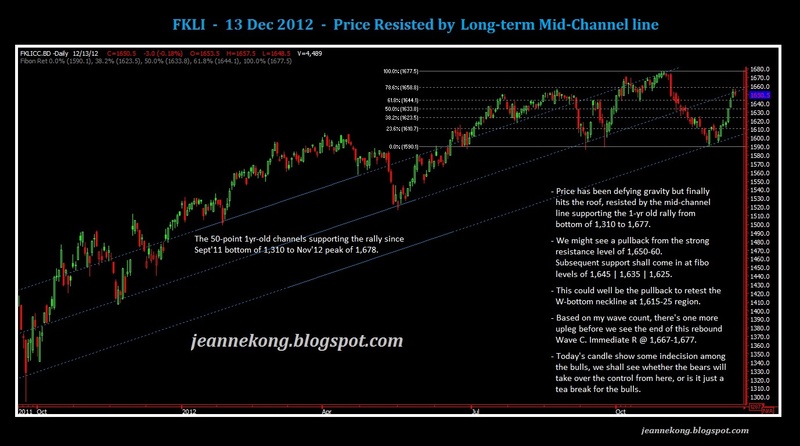 Read more on the LT channel lines in my previous post on Nov 28, on the potential reversal signal while we were at the 1,590 bottom then. 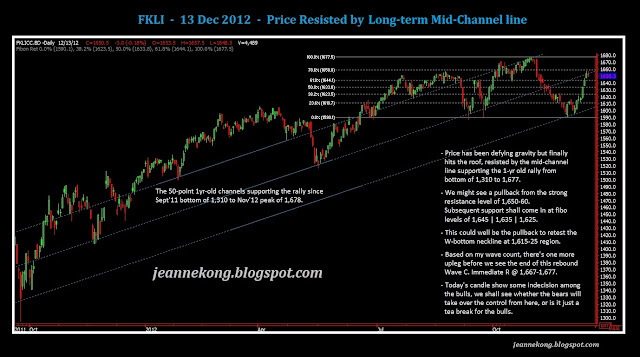 Here on, we can either get a stall/pause to the superb price rally, before it continues higher to retest 1,660 level. Or, we might see the sellers taking the long-awaited jump into the party pool, & start shooting down the exhausted bulls. All we need is a confirmation of a breakout to the up- or downside from tomorrow's price action. If tomorrow sees a white candle, its a continuation, we might see further push to re--challenge the strong resistance level ahead, 1,660 | 1,670 | 1,677. If tomorrow we get another red candle or indecisive signal, I bet the bears will not wait further to jump in & make a killing. Subsequent support for the pullback will come in at 1,645 | 1,635 | 1,625 (W-bottom neckline). If we are going to get a new high before the year close, it will better pullback to retest the W-bottom neckline, building a solid base for price to jump higher. Or else, a pullback below 1,615-25 level shall pronounce the bears' victory to reverse the trend back into the previous corrective mode during the Nov plunge. Statistically, December month always favors the bulls. However, this year we have the all mighty mr. Fiscal Cliff blocking the bulls' way to the finish line at Dec 31, 2012. We shall see whether the statistics or the macroeconomics which prevails, with 18 days left to battle it out. To my dear readers, I would like to know how I can improve on my postings.